I totally forgot to post the other sweet treasures I had made for my daughter's baby shower. Found these photos looking for something else. Anywhoo, here they are. My local chapter, The Spirit of St. Louis Smockers, was fortunate enough to host Debbie Glenn this spring for a workshop. 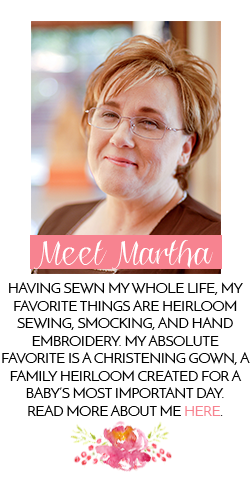 One of the classes she taught was her Banded Diaper Shirt and Nappy Cover. It is pattern #139. Cute and QUICK project. 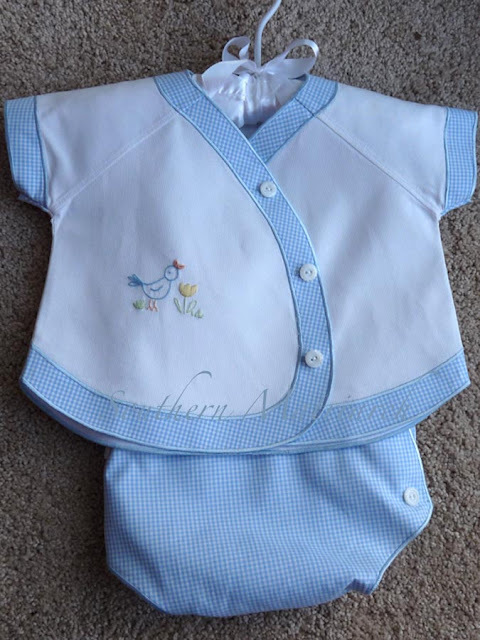 Her class kit comes in blue gingham with cotton pique. Generous kit and great directions. This project is so quick, I came home and finished the set that evening. 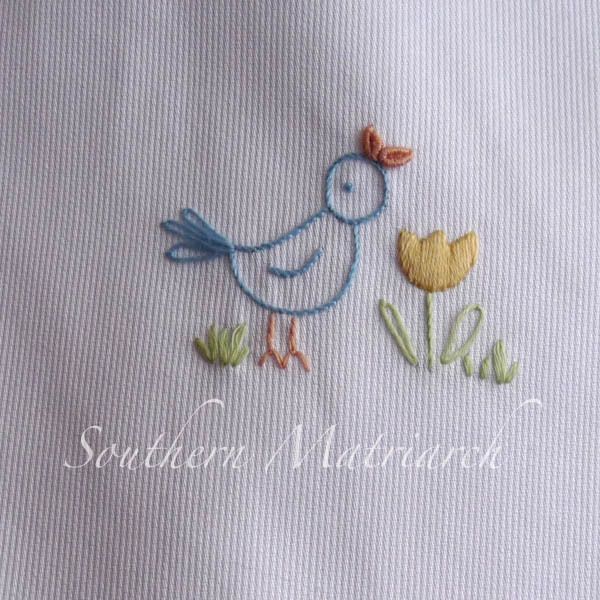 The provided embroidery design is a sweet little bluebird singing of spring. Did I mention this set is quick? I finished the second set the next day! I had some of the same pique in my stash along with some spring green gingham. My love of gingham is known far and wide. Her kit was generous enough to include enough fabric for the second diaper cover. Debbie teaches an interesting method of doing the appliquéd bands on the diaper shirt. I did change up my order of work for the second shirt though. I stitched my side seams before satin stitching along the outer edges of the bands to enclose that "tail" of the French seams along the bottom of the sleeves and hemline. And a future DZ houseboy needs a little green turtle! This cute little guy, came from Michie' Mooney's book, Heirloom Embroidery. He was quick to do. Not sure he is my finest embroidery, but he is kind of cute. If you need a quick gift, these are just the ticket. You could also substitute macine embroidery or applique. Don't forget to comment on the post below to enter our wonderful giveaway of DOVO scissors. Love these, and you are so right-quick and easy! Always nice to finish something immediately after the class! Buttonholes and buttons and I'm done with the second diaper cover. Yay! I could use a new pair of scissors! That is going to be the best dressed little boy ever! You have the best dressed grandkids, ever. Would believe my girls are going to be 1 this coming week. Where has the time gone? LOVE these! Do you know if they are available as a kit? Such lovely work. I just love looking at them. When I saw the turtle, I knew there had to be a Delta Zeta alum in the picture. Great work. Is your daughter the alum or yourself? I am from Oklahoma State. Oh my Goodness, these are adorable. I share your love of gingham, especially for babies. You just can't go wrong and there are so many possibilities. The embroideries are really sweet. 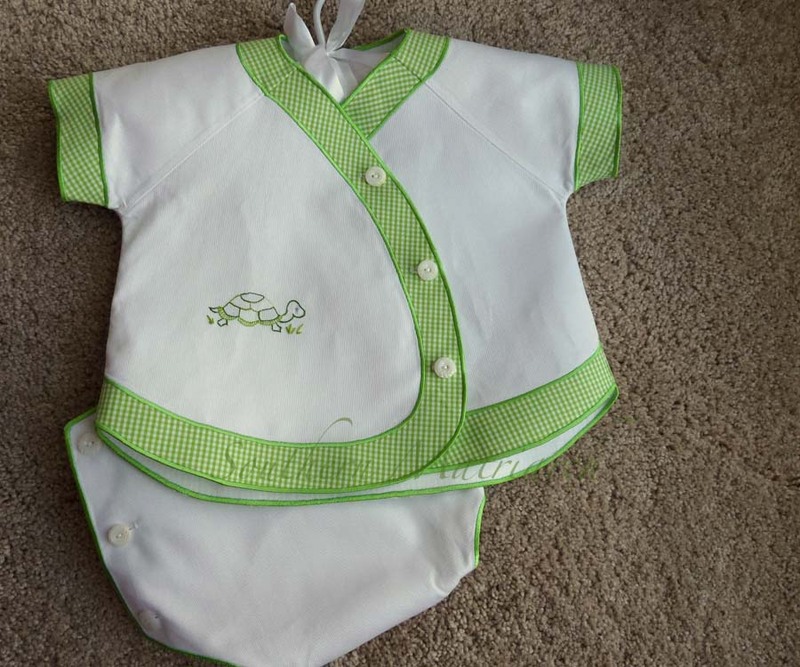 I am so anxious to begin smocking and heirloom sewing...these little outfits look so sweet and fresh. 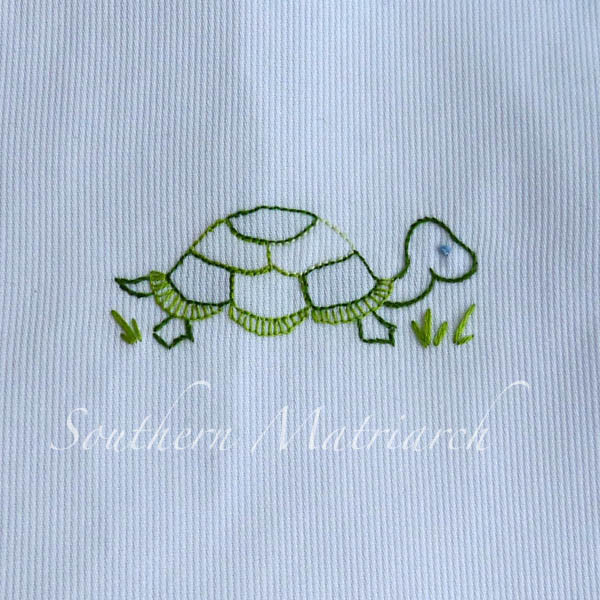 Love the turtle embroidery. 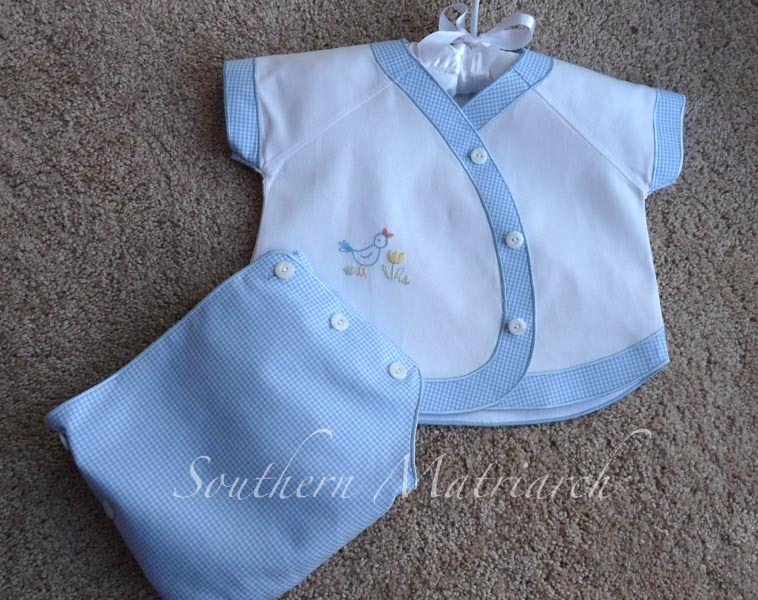 Delightful little boy sets! Now I have another pattern on my 'To Buy' list! These sets looks so fresh and comfortable. Bravo! Clang, Clang, Clang Goes the "Streetcar"